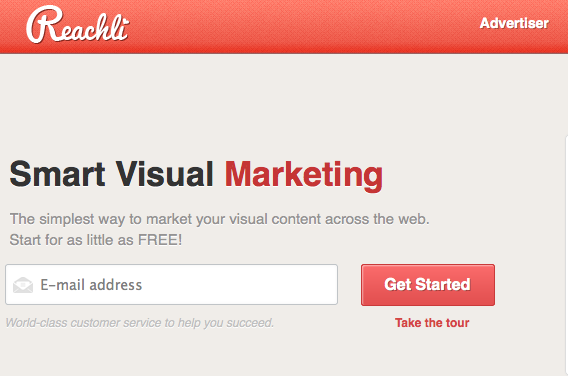 Reachli (formerly Pinerly) is a service that helps you create and track Pinterest campaigns. To get started using it, you will need a Pinterest account. Once you've got that, go to Reachli's website. enter your email, and click "Get started." You'll receive an activation email at that address, which will bring you to a screen where you choose a username and password. After that, you'll need to connect it with your Pinterest account. Walk through the tour. The most important piece is the Reachli bookmarklet. All you do is drag the little button that says "Reachli" from the page onto your bookmarks or favorites toolbar. Now, when you have something on your website or another website that you want to share on Pinterest, all you need to do is go to the page you want to share, then click that Reachli button in your bookmarks or favorites bar. When you click it, Reachli will open a pop-up window and ask you to choose which picture on that page best represents what you're pinning. Once you choose a picture, then you can enter a description of the pin. Make sure "shorten & track" is ON (it is, by default). Click the "Post It" button, and another pop-up window appears. (You may have to log in to your Pinterest account at this point, but once you're logged in, here's what you see. Enter the text exactly as you want it to appear on Pinterest, choose which of your boards you want to pin it to, and click "Pin It." Then you'll see this. Close the window. Your Reachli window behind it should now look like this. Click "I pinned it on Pinterest." You'll see this screen. Go ahead and close the window. You're all done! 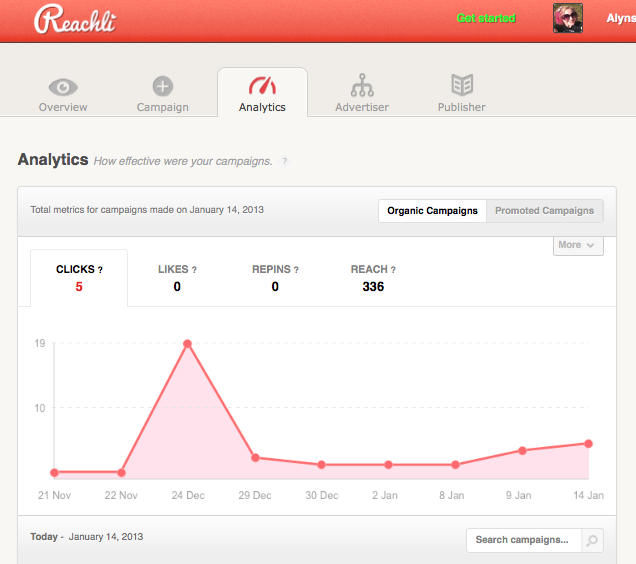 A few days later, come back to Reachli's website, log in, and view the results of your campaign. The "Overview" tab gives you a quick glance at all your pins and overall performance. The "Analytics" tab gives you a nice graph, showing clicks over time. And that's all there is to it. 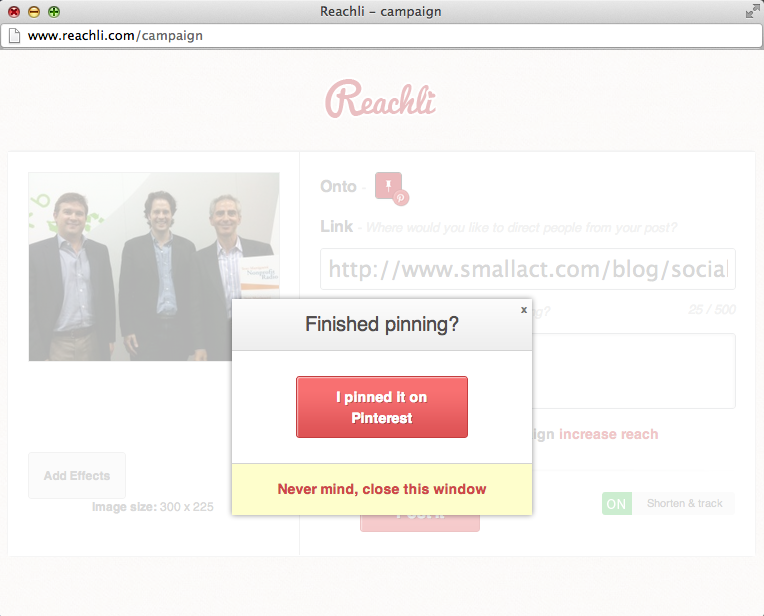 Reachli will help you easily track which of your pins are getting the most traction. It's a handy tool! If you know of other Pinterest-tracking tools you want to recommend, post about them in the comments.